I’m not even going to acknowledge the fact that I woke this morning to temperatures that were pretty dissful for nearly March. Let’s just pretend spring is happening now! Let’s talk about that instead, okay? Finn and I were pretending that spring was already here when we started planning this seasons veggie garden, so there, take that winter. This is our 3rd year of tending to a raised bed garden. If you’re interested here are the links to years one & two. Every year we learn a little more about what grows well in our garden, what grows poorly, what we love, and what we don’t like to eat. The first year it became obvious very quickly that tomatoes were not thrilled with the amount of sunlight on this side of the house, last year we realized that our peas need a trellis to grow on, and although I would love to grow cabbage, it wasn’t even close to being fully grown by the time the first frost came around. All that trial and error makes us better gardeners (hopefully). We adjust what we order seasonly based on our growing (ha, pun) knowledge. This year we are eliminating purple green beans, because the kids think they are weird an don’t eat them, instead we are adding more “regular” green beans. Swiss Chard is getting the axe because although it was beautiful, even us grown ups didn’t eat it. Instead, we are adding a bunch of new stuff, because as you may have noticed above there is an addition being added to the garden (more on that below). This year we will be trying potatoes for the first time! I nearly blew Finn’s mind when I explained to him that all we have to do is throw a sprouting potato in the ground and it will grow new potatoes, woah. We’re gonna try our hand at beets, because through our CSA I discovered I love them, and we’re adding a salad bar in the form of a new raised bed garden! Finn is always really helpful when it comes to gardening, he gets excited to watch things grow. I can’t blame him. 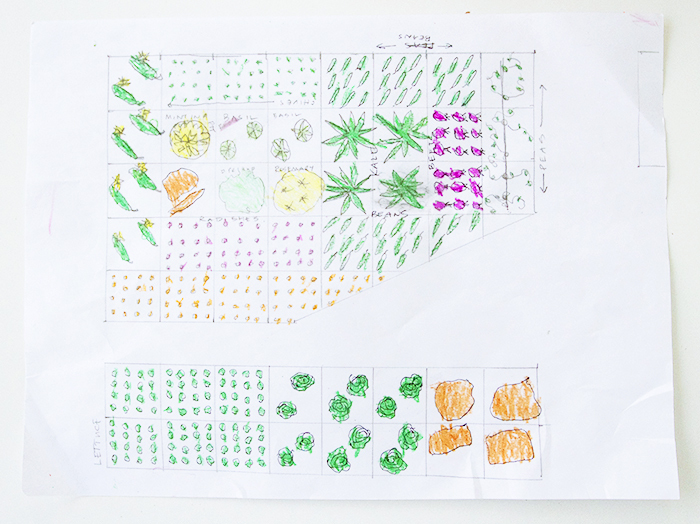 Here he is planning out the garden – he’s a math fiend and he cares more about the organization than the actual planning – I wonder where he get’s that? I’m hoping to get my little guy Gus more involved this year too! For those of you have kids, gardening has been a great tool for helping our kids understand where food comes from, and how much effort it takes to grow it. 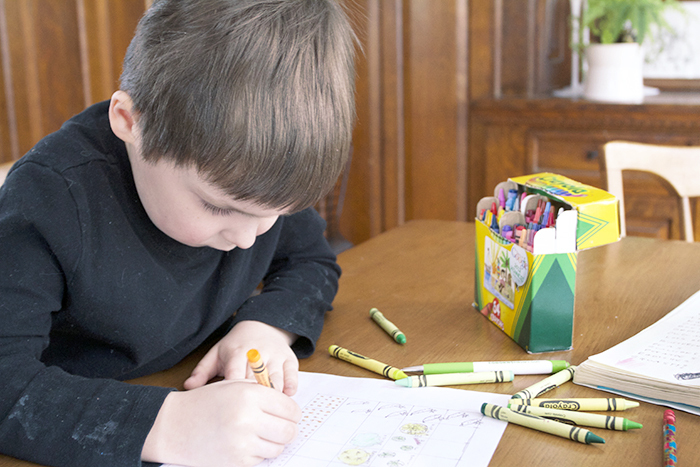 Plus, there is the added incentive of getting them to eat their veggies – this only works for us during the summer. It’s all mac n’ cheese and chicken nuggets for the other 7 months of the year. This is a picture of our garden from the first year! 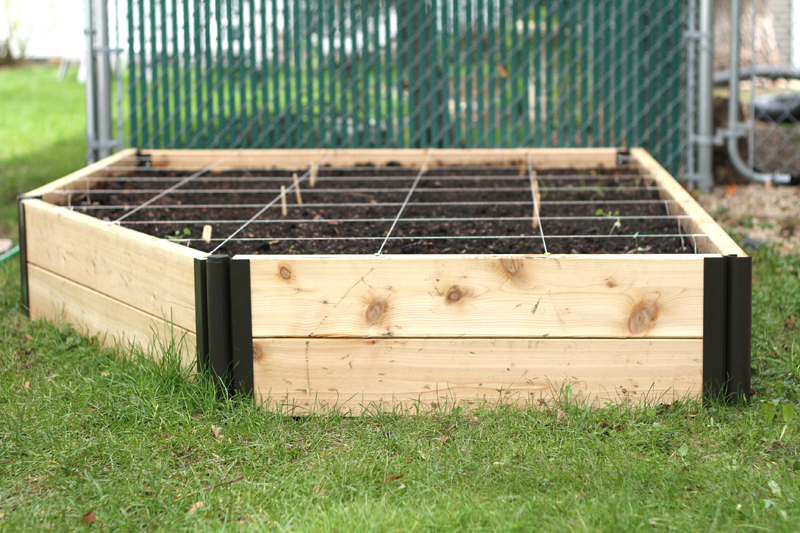 We built it using Burpee Pro Series aluminum corners since we needed our garden to follow the lines of our house. I mentioned above that the garden is overlooked by our dining room – the dining room has a bay window and we wanted to create a path between the house and the garden (see below). I mean, your garden has to look good, right? My best advice is to keep thorough garden notes from year to year. Keeping notes has been very useful to us – the blog helps a tons, but I write a lot in my notebooks too. Without good notes I’d probably continue to try growing the same veggies every year, and continue to fail at veggies that just aren’t happy growing in this location. As I mentioned, we have big plans for this year, we will be adding on to our little veggie garden which makes its home on the south side of our house (right near our dining room window). Our side yard is only used as a pass through, and using the space for our garden has worked out well. However, it’s not super sunny on the south side, and as a compromise we have to grow a lot of shade loving veggies. Because we live in the city there is not a lot of yard space for our veggie garden. We have found a lot of success with the square foot gardening method, allowing us to get the most veggie-growing-space for our buck. I would highly recommend it to anyone considering starting a veggie gardening of their own. 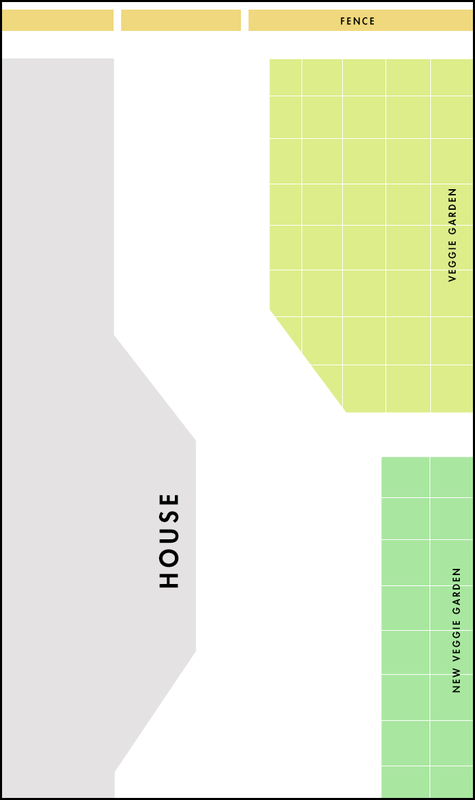 We plan on using the square foot method for our future garden addition, adding 16 square feet of new beds to the yard this year! In the above image you can see the proposed addition. Jeff and I eat a lot of greens during the summer and I would like to make this new addition a salad bar, hopefully providing us with enough greens to eat at every meal. We love Arugula so we will grow tons of that! I can’t wait! In case you’re curious (and because I like to take notes) here’s a list of all the seeds we will be ordering this season! We’ll be ordering all of our seeds from Park Seed. 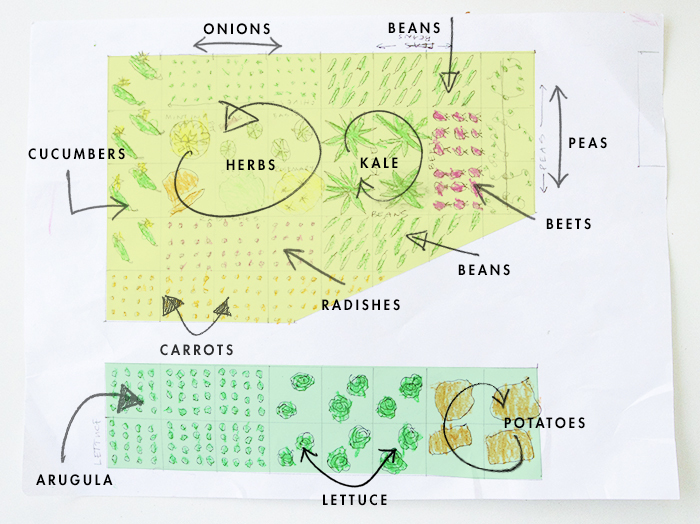 We’ve been planning our garden this year too, it’s a good way to forget about the way-too-cold temps right now (we’re S. Mpls!) Just wanted to mention that I’ve had a lot of luck with Fedco Seeds, if you were looking for more garden catalogs in your mail. They are in Maine so have a lot of varieties that grow well in short seasons and also offer a lot of open pollinated heirloom seeds at really great prices. Open pollinated means that you can save the seeds for planting, as opposed to hybrids which won’t grow true to type. We’re going to try seed saving for the first time this year so fingers crossed! Jasmine! Sorry it has taken me so long to get around to comments this week. Thank you for your input. I still have my cart open at parkseed, I’m just making a few last decisions but I will for sure go check out Fedco Seeds before I place my order. I wish I knew as much about seeds as you do – I am so curious about seed saving – I’ll have to do some internet research. Let me know how it goes for you at the end of the summer. Hi Erin, Sorry I have been so lame about responding this week – I got really busy at home and am just getting back to my computer now. Thanks for the tip and link on the salad bed cold frame, that will be something I check out for sure. Usually around August I become a bad gardener, and only put half my heart into it. Hello! Thanks for sharing your plan/experience. I wonder if you’ve considered kohlrabi? It’s similar to cabbage flavor, makes a great raw snack, and grows well in MN. Yes, Kohlrabi does grow well here too but I don’t love it. The asian greens are fantastic. We live in Chinatown in downtown Boston and my garden is in the “Chinese” Community garden. So we have great seeds available in our markets for choys, mizuna, choho which all grow well (no bolting) and are delicious. The gardeners around me produce 3 full rotations of food in their gardens. It is kind of wonderful to be around. Hope the salad bar is a success! Hey Kristin, I haven’t consider it. I have tried growing cabbage in my garden before and it doesn’t mature all the way before winter so I would be wary of other plants that require long grown periods. Does Kohlrabi require an entire season to grow? Great plan. I was just reading about the square foot method the other day and thinking of giving it a try. One thing that was holding me back was that someone told me a garden needed at least 8 hours of full sun a day to produce much. Glad to hear your south-facing garden is partly shady. The area I am eyeing for planting is south-facing and gets more dappled light, but gets it most all day. Allison, I think our garden light situation sounds identical. I can’t grow tomatoes or peppers on that side of my house, but I’ve had great success with greens, radishes, carrots, herbs and cucumbers. It’s a nice little salad garden. The square foot method makes it all seem doable too, I would highly recommend it. I remember that feeling of planning a home before the home is even “your home”! I hope you guys find the perfect place, also, I am beyond jealous of your nice weather. I am soooo looking forward to planting again! Last summer I decided to up my number of beans I planted (green, dragon’s tongue, and the tri color yellow, green and plain purple, I forget the name) and holey moley did I get beans. We couldnt’ eat them all, pickle or freeze them all or give them all away before some grew to super giant length. I had a giant basket every day. I am still sick of beans, so I’m not doing that again. I wish I had better luck with cukes! I have half-sun at best, and my tomatoes do fine but I have never had a big cuke harvest and I want it. Any cuke tips?